Around the mid-1700s, a different kind of piano was emerging in Germany, like a rectangular table with a keyboard set into the longer side, in similar form to the clavichord, and known in Germany as a QUERPIANO (pronounced “kvair-piano”) or QUERPIANOFORTE. We could translate this literally as a "queer piano" and it would have seemed strange to people at the time, because instead of the strings running front-to-back, they ran sideways at an angle. Diagonal, or slanting, or crosswise, are other meanings of "quer" and there were also "Querflugels" - grands with transverse stringing, as well as “Querspinets”. Something like 70% of the surviving pianos from the 1700s are querpianos. I am grateful to the specialists who have helped me with individual points about these instruments, because they have more hands-on experience of repairing them than I do. Most of us are searching for the truth. Having said that, I have been collecting piano information since the sixties, before some of them were even born, so I have often picked up paperwork and information that other people have not. Back in the seventies, I came across several unexciting old German piano ads where grands were “Flugel”, uprights were “Klavier”, (or sometimes “Pianino”) but they used a term with which I was not familiar, describing square pianos as “Querpiano”. I learned from the experience, and filed the paperwork away, thinking very little of it. Now, various experienced specialists who have never heard the term seem to think I made it up, but what would be the point? I apologise if I feel obliged to spend a little time and space defending my use of this term, before getting onto the useful, practical issues. You can flick down the page until you see pictures. I am grateful to Christoph Dohr M.A. for pointing out the following items, which may be found in Google Books. He knows of German references to Querpiano-fortes up to at least 1835. The term “Querpiano” persisted in Germany until the mid-1800s, the item on the left is dated 1832, and although Bechsteins tell me that they have never come across the term “querpiano” in their archives, they were not established until 1853, and abandoned the production of square pianos quite early on, except for special orders such as Wagner’s. There are several references in the 1854 Munich exhibition to makers of “excellent Querpianos”. These instruments became much more successful around 1760, when German makers brought them to London, but by the 1790s, the term had become corrupted in England to "SQUARE PIANO" but these instruments are rarely square in shape, although they are arguably squarer than a grand. I am grateful to Lynda Mackillican for this print. The art is cartoon-like, but the English heading is very unusual in using the original German term “querpiano”, whereas most English people referred to them as square pianos. I can’t guess the date of publication, but it shows (roughly) a querpiano of about 1820, with lyre-shaped pedal unit, and empire legs, 2 features that are described further down this page. Querpianos may have appeared in the 1740s or even earlier, but their precise origin is lost in the mists of time, and continues to frustrate piano historians, who battle through all the misinformation that burgeons with the help of mistaken authors and couldn’t-care-less websites. So many people who know nothing set up “piano history” pages. As early as 1707, the piano’s inventor Cristofori had made one piano “of a different shape”, and one could speculate that perhaps the most likely choice would have been the rectangular form of the clavichord or the virginals. Although that is pure conjecture, the fact that it does not fit our story conveniently is no excuse to sweep it under the carpet. In the Neupert Collection, there is a Johann Socher querpiano said to be from 1742, but there seems to be no evidence for this date, and I would guess it was nearer 1755, perhaps still a very early example, but with no provenance. The querpiano at the Gemeentemusum is marked “Silbermann fecit 1749” on a piece of paper inside, but although I would love to think that this may be correct, such labels cannot be accepted as real evidence, and the piano has also been altered. If it was made by Gottfried Silbermann, he died in 1753, so this querpiano would be before that. Palace Pianos have an early German querpiano, perhaps made around 1750 but, again, with no provenance. What we do know for a fact is that The Illustrated London News reported in 1853 that among the items lost in Kirkmans’ factory fire was “a curious clavichord – once belonging to the great Handel, and from which the idea of making the square pianoforte was originally taken”. This seems to confirm that querpianos existed before Handel died in 1759, at the end of the baroque period. 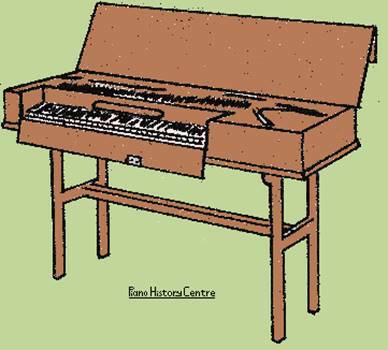 Handel’s will is kept at the Foundling Museum, London but their librarian, Katharine Hogg, tells me that this “curious clavichord” is not mentioned, so Kirkmans must have acquired it from him before 1759. Of course, later research can often undermine earlier findings, but it is nevertheless important to look at original sources. This was the time of the Seven Years War, (1756-1763) when Germany and England were allies, and many Germans fled to London for safety, including a dozen or so pianoforte makers, who became known as the “Twelve Apostles” because they brought piano-making to England. Whether there were actually twelve, and who they were, is the subject of some debate. According to some sources, they may or may not have included Backers, Beck, Beyer, Buntebart, Ganer, Garcka, Geib, Meyer, Pohlmann, Sievers, and Zumpe. Largely because of the popularity of querpianos, piano-making suddenly burgeoned in a way that it had never done in Germany, and I have always imagined that these immigrants were already making them when they arrived, it would seem an odd coincidence to arrive in London and instantly invent a new type of instrument. Helen Rice Hollis says that apart from Silbermann’s, no grands existed in Germany until 1773, only squares, a statement that is difficult to rationalise, especially when the 1773 piano she referred to is not German, it is Austrian. Hipkin said “The distinguished organ-builder, C.E.Friederici of Gera, is reputed to have been the first to make a pianoforte in the clavichord or oblong shape”, and some internet sources refer to Friederici making a square piano as early as 1742, although this seems to be confused with the alleged date of the Socher, or with a vertical piano. In 1870, Fetis said “The first square pianos, attributed to Friederici of Gera, do not seem to go back beyond 1758”. Brinsmead interpreted this as meaning that Friederici invented the square piano in 1758. Liege said “1758 Christian Ernst FRIEDERICI invente le piano carré avec des cordes parallèles au clavier”. Alfred Dolge “Pianos and their makers” (1911) perpetuated this - “Friederici of Gera, Germany, ~~~~~~~~ about 1758 he built the first square piano in Germany” but Dolge’s misleading illustration, headed “Friederici’s Square Piano, 1758” shows a Regency-style 6-legged square, nothing to do with Friederici. Certainly, by 1780, Zumpe described himself as “the inventor of the Small Piano Forte”, and Michael Cole’s extensive and meticulous research shows that the earliest surviving square pianos that are reliably dated were made by Johann Christian Zumpe (an apprentice of Silbermann) in London, 1766. This doesn’t mean none were made before then, although the various claims that Zumpe squares as early as 1752 exist have not been substantiated. One that I saw was certainly a fake, the name had been cut out very crudely and stuck on, yet it had the look of a genuine Zumpe name. If we reject the idea of the existence of earlier querpianos just because none are known to survive, equally we should reject the idea of pianos existing in 1709, because the earliest survivor is dated 1720. Does it also follow that the earliest surviving wheel must be the first ever made? In 1879, Edgar Brinsmead confidently wrote that “All the pianofortes made in England were in the shape of grands until Zumpe, a German, commenced making small square instruments in 1760”. This seems wrong to me, the impression that pianos were made at all in England much before 1760, and that the German immigrants made grands before squares. Where are all those grands? I don’t know where the idea came from that Zumpe claimed the invention in London, 1765, but it seems too late. 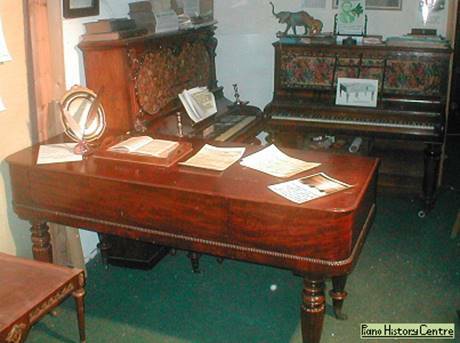 A Houston square piano at the Preble Historical Society is said to be from 1763, but there are all sorts of problems which make that date impossible. Vietor made a particular variant of the square piano, which he called “Piano Ex Forte” and claimed to have invented in 1767. In Victorian ads, Pohlmann & Sons showed a sketch of “The first pianoforte made in England, 1769”, by Johannes Pohlmann, but this was incorrect, and they seem to have had no direct family connection with Johannes anyway. In England, Broadwood called querpianos “Small Piano Fortes”, while Ganer called them “Rectangular Piano Fortes”, and Wales preferred “Quadrilateral Grand Piano-Fortes”, but “Square Piano” became the favoured name, sounding very much like Querpiano, and translated directly as “Piano Carré” in French. Sclettar referred to making “Grand & Square Piano-Fortes” until 1805, when he changed it to “Grand & Small Piano-Fortes”. (By 1814, he decided he was a “Piana-Forte” maker.) At a time when there were no upright pianos as we know them, the square piano was THE domestic instrument, and without it, pianos in general would never have become such popular and versatile instruments. Larger models were sometimes known as SQUARE GRAND or GRAND SQUARE. “Square Grand” is rather like saying “it’s round, in a square sort of way”. It’s another example where “Grand” just means big, as in French. When one is trying to estimate the date of manufacture, the bodies of the instruments are often fairly similar, and one of the most useful methods is not very technical, it involves the design of the stand or legs, although it is important to bear in mind the fact that these can get lost, broken, or replaced, so they may not be original or authentic. They are also adapted sometimes, perhaps a pedal leg built onto a piano which did not originally have a pedal. Some square pianos had hand-operated stops to raise the dampers, or produce other effects, but very few had pedals until the 1790s, although some have a metal fitting underneath that can easily be attached to a metal rod bent in the form of a stirrup, without the need to construct an actual pedal. Some early square pianos made up to about 1805 have round, slim, tapered, fluted legs at the corners, not unlike the ones used on Viennese fortepianos. Erards are probably the most common examples, but quite apart from clavichords, there is the Socher, the anonymous early German squares at the Royal College of Music and at Palace Pianos, plus others by Ganer, Guante, Jaeckel , Maucher, Pra, Roduwart, Silbermann, Southwell, Systermans, Swannen, etc.. These are possibly modelled on German or Austrian originals, no firmly-dated examples of those have survived as far as we know, so it is useful to search Google Images for clavichords of the period for comparison, but don’t blame me if you find naked women sprawled across them! The same sort of tapered legs are found in some Sheraton furniture, but so-called “Sheraton Model” pianos sometimes bear no resemblance at all to Sheraton’s styles. Many early squares follow on from Zumpe with similar, very simple TRESTLE STANDS, not actually separate trestles, but two end frames joined by a crossbar, the whole stand considerably shorter than the piano that sits on it. The trestle stand allows the option of placing the piano on a table instead, one of several applications of the term “table piano” (taffelclavier). Clavichords do not seem to have used trestle stands, this design was perhaps peculiar to square pianos. Far too many generalisations about keyboard compass (range) have been made, but I think it is fair to say that keyboards remained within 5 octaves (61 notes) until about 1790. It is important to realise that most of the “great” composers such as Mozart had only 5 octaves to work with, little more than the vocal range of a choir. It is possible to make good music within 3 octaves, but it is somewhat restricting. At that time, some of their keyboards had what modern eyes would call reverse-coloured keys, like clavichords and harpsichords, and some Italian makers may have continued like this into the 1830s, although most others were gone by the 1800s. 6-octave keyboards (73 notes) are unlikely to be found much before 1820. The makers’ names were often latinised until the late 1700s, for example 1794 is said to be the earliest date for pianos marked "John Broadwood & Son". Previously, they were marked "Johannes Broadwood". Broadwood was selling pianos by 1773, when Tshudi died, but according to research in their archives by Michael Cole, no square pianos (and therefore no pianos) were made at all until 1780. Although the piano was invented around 1707, a 1933 Erard booklet described their company as "THE OLDEST MANUFACTURER OF PIANOS IN THE WORLD". In examining this claim among surviving firms, Broadwood seems a likely rival. Some reports say they made their first pianos in 1773, modelled on “English” squares, and back in the eighties, Broadwoods sent me their square piano numbers from 1775 onwards, but Michael Cole’s research in their archives shows that no pianos at all were made until 1780, so any “Broadwood” dated earlier than that would have been supplied to them by another maker. On this basis, Erard was the oldest surviving firm of piano makers, starting in 1777. He is said to have based the design of his square pianos on “English” pianos, yet the foremost English maker had not made any yet! The Kirkman harpsichord company was earlier, originally Kirckman, established in 1730, and they were already making pianos by 1777, but the company did not survive. Some pianos of the 1700s have what is known as a SHORT OCTAVE in the lowest bass notes, with some notes left out. In the example above, there is no F# at the bottom end. Many squares had fancy wooden mouldings as key-fronts, at least until the 1840s, and Lucy Coad tells me that fronts like these were already being used by Broadwood as early as 1783. In the 1780s, the trestle stand was quickly replaced in most London squares by the FRENCH STAND, a horizontal, open oblong frame with slim, tapered square legs at the corners. Broadwood called it a “French Frame”, and the name of this much more elegant style seems to imply a design from France, but I can’t recall any French examples whatsoever. A 1777 Kirckman owned by David Hackett seems to be the earliest known, but another Kirckman example of the same year has a trestle stand. Ganer was using French Stands by 1781. Although I have seen some that were secured by screw clamps, the piano usually just sits loosely on the stand. This nameboard is from our 1805 Broadwood square piano, which was kindly donated by Mrs Kate Pocock and Geoffrey Hunter. The instrument is a fairly late example of the use of a French Stand. The action is in working order, but the tuning will be a long job! French stands continued to be made until at least 1807, but they are fairly frail, and once damaged or lost, they are more difficult to replicate, so they may be replaced with separate legs or older trestle stands, leaving no evidence that they were ever there. I am not convinced by the suggestion that some American makers were still using French stands in the 1830s, and Tom Strange says they are unknown in American pianos after about 1812, or perhaps even earlier. References to any of them being “William IV” (1830-37) are usually wrong, but Scherr is said to have made them around 1828-33. Some variations of the French stand have a shelf under the keyboard, cut away to avoid the pianist's legs, like our Masterman here. (Masterman succeeded Longman, and sometimes applied his name to pianos made by Dettmer.) Despite suggestions that these shelves are not original, there are enough of them around that I feel that they must have been made that way. Dates varying from 1785 to 1811 have been estimated, but most of the examples with definite dates are within the 1790s. What I find puzzling is that in different towns, and even different countries, the shelves were often made precisely the same shape. Why would anyone bother to copy the shape of a shelf? I used to tune this Joshua Done square piano made in 1795, restored by the late Paul Neville, and it was for sale in 2016, but we have been unable to contact the owner after she moved house. It may be the same piano that has been advertised on Ebay recently. By the 1790s, some square pianos had pierced fretwork soundholes set into their foreboards, and the particular design shown here was used in virtually identical form by Broadwood, Clementi, Dettmer, Holmyard, Longman, Rolfe, Tomkison and others, from at least 1798 to 1822, so we can only guess that perhaps they were off-the-peg units made by separate outworkers who supplied fretted foreboards to various makers. It is only at a much later date that any classified lists of ancillary pianoforte trades are available from the London directories. Graham Walker tells me that this feature was patented by William Southwell, Dublin, who made the earliest extant example in 1793, (confusingly bearing the number 1784) now at Croft Castle. Southwell called the frets sonovents, and their design sometimes provides useful clues to dates although, like stands, they can be altered or replaced. There were similar instruments with experimental shapes, such as Southwell’s semi-elliptical or demi-lune pianofortes (often incorrectly described as “semi-oval”) but the rectangular form remained the most popular choice. Henri Pape made hexagonal pianos. When I asked if I could take a photo of this painting in a Rye antique shop in 2010, the man gave a wry smile, and wasn’t really listening to what I was saying. 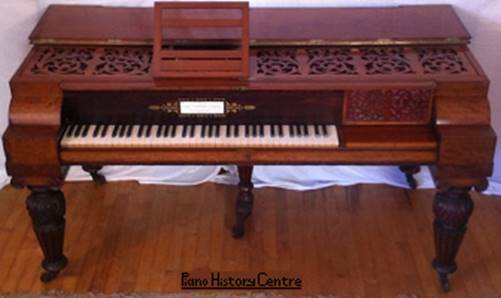 It appears to show Hortense de Beauharnais’ distinctive and well-documented Erard 1809 square piano. Maybe it is a very important painting, I don’t know, but one website says a very similar picture is by Boldini, who seems to have been as fascinated by pianos as he was by the female form. “Empire Style” is a Napoleonic fashion that was popular around 1805-1825, or “circa 1815”, but as far as pianos are concerned, it is difficult to define it consistently by anything other than the legs, which are usually thick, smooth cylinders, tapering slightly towards the top, and sometimes with thicker cylinders at the base. 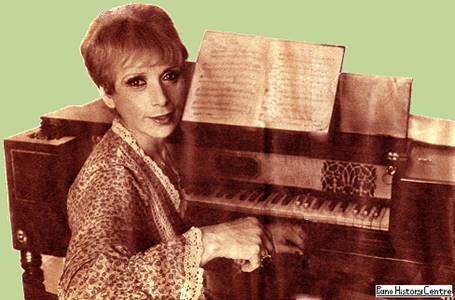 Actress Miriam Karlin wrote to me in the seventies about her William Rolfe 6-legged square piano. Examples like these with 6 turned legs, (4 at the front) are often vaguely described as "Regency", and strictly speaking, this means 1811-1820, when the Prince Regent ruled, but some examples may be as early as 1803, or as late as 1828, although “circa 1816” is a rough estimate for the ones with square front corners. In America, there are references to 6-legged square pianos by Babcock and others, said to be as late as the 1830s, and even this printing block from 1848. Ads sometimes used standard printing blocks which did not represent the actual makers’ current products. Jim Walsingham tells me that his 1817 Gunther & Nutting square piano has 8 legs, 4 on the front, 4 on the back, as well as a pedal leg. This is very unusual, and even tables of the period often had 2 at the back, and 4 at the front. A minor point is that some square pianos have a type of decoration called “stringing”, thin lines of light-coloured boxwood inlaid parallel with the edges. It is sometimes said that after the death of Nelson in 1805, some makers used ebony or blackwood stringing instead (shown in this Stodart owned by Jean and Doug Cheever) as a tribute to Nelson. This may be true, it’s a nice idea, but ebony stringing was in occasional use in some earlier squares, so ebony stringing doesn’t necessarily means it was made after 1805. In a local auction, I came across what appeared to be 2 examples of square pianos converted into writing desks, one was a Broadwood with French Stand, which fetched more than we would pay for a working piano, but the 6-legged one had the style of square tapered legs that are associated with French Stands, and these are virtually unknown on 6-legged square pianos, so perhaps it was as labelled – “Edwardian Desk”? By 1820, George Dettmer was advertising “Square and Circular Cornered Pianofortes”. Clementi made some square pianos with rounded front corners in the 1820s, and Collard & Collard continued with both shapes after Clementi’s death in 1832, but for reasons that are a mystery to me, the technology or the desire does not seem to have existed to produce rounded front corners until about 1816, so "circa 1823" is a rough estimate for 6-legged squares with this feature. Tim Harding says “there was a brief vogue c.1804-1808 for wider-radius corner pianos”. In 1825, Stodart’s pricelist offered “Small Piano-Fortes” with various permutations of circular corners, drawers and ornamentation. Legs were not described, but drawers usually implied 6 legs. 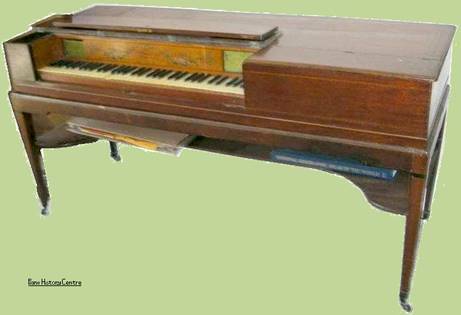 Around the 1820s, some very tiny pianos were made that were almost literally square, variously described as sewing table pianos, portable pianos, work box pianos, toilet table pianos, or conductor’s pianos. Some of the actions were very crude, more like toy pianos. 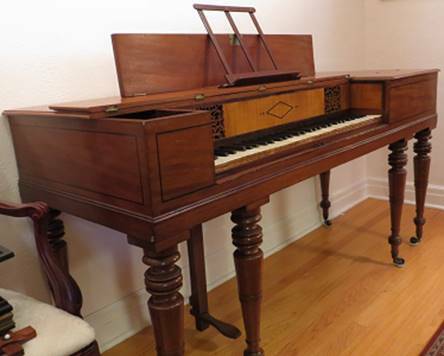 Chappell made their “Pianino”, which seems a reasonable name for a very small piano, although the term was later widely used for French and German upright pianos. This particular Pianino had glass bars instead of strings, so it was more like a Celesta. A few examples survive, including one in the Victoria & Albert Museum. 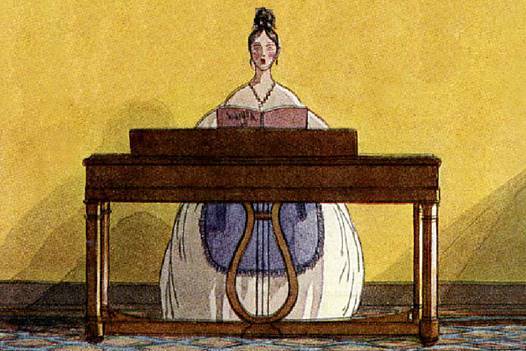 English square pianos of the 1830s onwards, being heavier than the early ones, often have a more substantial leg at each corner, to support the weight, and a similar (but slimmer) leg for the pedal, to the left of centre, so it is intended to be operated with the left foot. See also the reference below to “London Legs” . 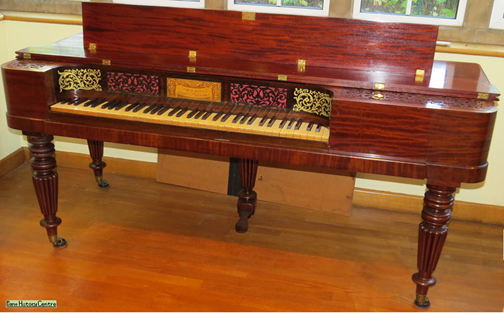 This is Graham Forbes’ Mott square piano, circa 1830. I have been given several conflicting statements about dates when square pianos had legs with the parallel vertical grooves, known as fluting. Reviewing images we have on file, and ignoring the earlier thin tapered legs, I can see examples of fluted legs as far apart as 1805 and 1845, so a mean date “circa 1825” would be too rough to be of much value. Here is an interesting Youtube video of a Collard & Collard square piano. Square pianos are not usually symmetrical, because whereas the strings occupy the full width, the keyboard has to be set to the left. People who were ignorant of such technical matters complained about the lack of symmetry in this “furniture”, and by the 1830s, some squares were designed with a recessed area on the front, making them symmetrical when closed. The lyre is an ancient musical instrument that has become the emblem for all sorts of musical situations. By the 1830s, more and more makers were starting to use a lyre-shaped pedal unit, which became so popular in grands and squares that the pedal unit is now known in the trade as “THE LYRE” regardless of its shape. Until recently, the David Howkins “Museum of Memories” - had what seemed at first glance to be a fairly ordinary room, but if you examined the furniture and fittings closely, you would see that what appears to be simple colour and decoration is skilfully made up of antique postage stamps – thousands of them. Philately gone mad! (Val Howkins’s grandfather was the manager of the “Elephant Man” Joseph Merrick.) Back in 1973, Richard Meadon contacted me about the Albert Schafer Collection, a whole room-full of items decorated by encrusting them with international postage stamps, including what Richard thought was a clavichord. It is actually a Broadwood square piano of about 1833, and my name appears in a booklet about the collection. The piano’s paper name-label mentions “Makers to Their Majesties and the Princesses”. This places it before Queen Victoria, but the phrase doesn’t seem appropriate to King William IV, or to King George IV. Sadly, any serial numbers are hidden by postage stamps, which oddly line the inside as well as the outside. The Blue Peter programme did a piece about the collection, which has been on display in Great Yarmouth. Now that our dear friend Val Howkins has died, the future of the stamp room is uncertain. Have you seen the film “The Piano”? I have said previously that in a film with its plot centred around a Broadwood square piano, nobody bothered to take a moment to check what one should look like. I was amazed to receive photos from Colm O’Leary, who has this Broadwood square piano identical to the one in the film, dated 1839, so I was wrong, as were a number of other piano people! In half a century of collecting information, I had never seen one like it before, and it is certainly not the normal design one expects from a Broadwood square, or any other. A very similar instrument on the net is attributed to J.A.Knam, Vienna. As to the design of the so-called "London legs", almost identical ones were made in vast quantities between the 1830s and 1880s, for grand pianos, square pianos, and cottage pianos, virtually the same hexagonal legs in thousands of instruments. These were firmly established on most cottage pianos by the late 1840s. The majority of pianos produced by Erards’ London factory in the 1800s had these “London legs”, whereas their Paris models had a great variety of leg designs, and only a few of these. 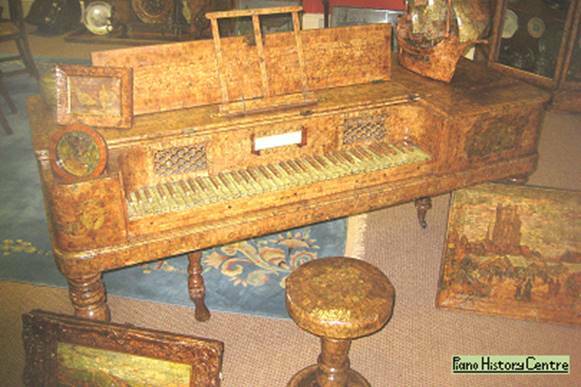 From about 1855 to 1875, or “circa 1865”, some pianos had a more ornate, carved top section, sometimes painted gold. At a time in history when ladies didn’t show their legs, it may have been an enjoyable occupation for the men who carved legs for furniture and pianos, often featuring a thigh, calf and ankle. 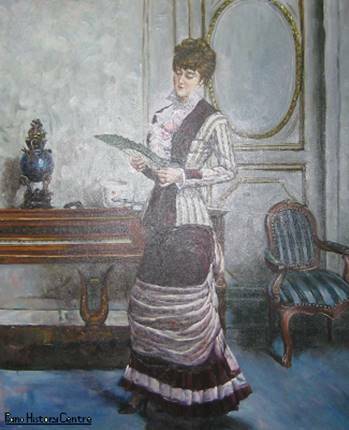 Over the years, I have heard various people suggest that the Victorians made skirts to cover the legs of their pianos, but I have never found any evidence to support this, and there are plenty of period illustrations of showrooms and exhibitions where the piano legs were on public view. Here’s a little puzzle from the Great Exhibition, 1851. The Collard & Collard square piano in the photos is clearly marked with added lettering around the name, to say that the piano was “manufactured expressly for The Great Exhibition”, and “for which the jury awarded a medal”. This presents two problems: Firstly, the event was not known by that name originally, and secondly, the medal was withdrawn during the exhibition because of “some jealousy” among the other makers. I can only guess that the lettering was added after the exhibition became “Great”, but before it ended. The engraving from the catalogue (left) shows similarities, and it is likely that the gadrooned decoration on the lower front edges was not part of the piano. As the popularity of square pianos dwindled, Collard & Collard still made them in the 1860s, but Broadwoods made their last in 1866. Very few English squares survive from later dates. German makers seem to have largely abandoned square pianos in Victorian times, for example Bechsteins didn’t produce them regularly, but squares were a major and important part of the American trade all through the 1800s. Chickering was still making square pianos in 1889, and Steinway carried on into the 1890s. A few were made in an almost semi-circular shape, like Lindeman’s “Cycloid” and (in Canada) Rainer’s “Dominion”, but the many examples shown here demonstrate how similar most of them remained in the course of half a century, in much the same way that we were churning out Cottage Pianos. This “Grand Square” or “Square Grand” was the type of instrument used by Abraham Lincoln, Stephen Collins Foster, General Custer, General Grant, Jenny Lind etc.. Organs were also made in virtually the same form. The Jack Wyatt Museum has a more modern-style Mathusek “Spinet Grand” designed to resemble a Square Piano, and the serial number suggests that it was made as late as 1936. Michael Stinnett kindly supplied these photos of its various models, and says “All the information I've been able to find over the years indicates that all American manufacturers had stopped building square pianos by 1900. We rarely see a square piano built after 1890, and we have never seen one built any later than 1898.” In 1937, Heller made upright pianos which imitated the shape of a square piano. Unless serial numbers dates or historical notes are available, it is difficult to do more than guess at the age of these American squares, and our guesstimates may be your best hope. It is difficult to imagine what the makers had in mind when they decided to “improve” the hugely successful square pianos by making them bigger, heavier, louder, and (often) uglier, but these monsters had completely lost touch with the needs of the piano-buying public, who still yearned for the neat, sweet, petite square pianos of a century earlier. When people encounter a square piano for the first time, many find them quite charming, or even exciting. The engraving on your left appears in our Illustrated London News, 1890, although I have coloured it. It was imitated in The Strand, 1895, and The Etude, 1906. Without donations, I will be fine, but our collection may not survive. If every visitor to this site made a donation, we would have a better displays in our museum building, and much-improved facilities for research within our own archives.